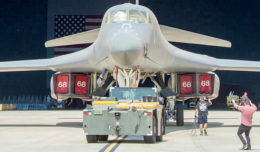 Married couples on Edwards Air Force Base, Calif., could benefit from a change in the tax codes that took effect earlier this year. Military spouses may benefit from the Veterans Benefits Transition Act of 2018. Spouses can now elect to use their service members legal residence for purposes of filing their state and local taxes, said Army Lt. Col. Dave Dulaney, executive director of Armed Forces Tax Council, Department of Defense. 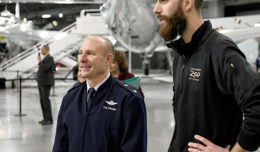 Another recent tax-related change that may benefit Airmen is the Tax Cuts and Jobs Act. Under the act, service members may see a reduction in federal taxes for 2018. There is an overall reduction of 3 percent for most military families under the act, as well as doubled the standard deduction and Child Tax Credit, according to Dulaney. For more information, Edwards Airmen can call the Edwards AFB Tax Center. The tax center can help Airmen file their tax returns for free. To set up an appointment, call 661-275-ETAX (3729). 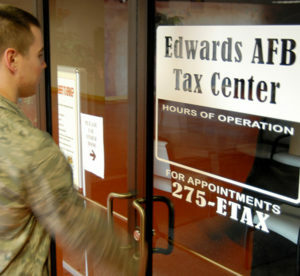 The Tax Center is open Tuesdays and Thursdays, from 8 a.m. to noon, and from 1 p.m. to 4 p.m.
For additional information, Airmen can visit the Military OneSource Website at: https://www.militaryonesource.mil/financial-legal/tax-resource-center/miltax-military-tax-services.